In fact, it does not require a great effort of the critical faculty to see that the way in which images are interlinked in nature is not a matter of a series of shocks but rather of passages which are ineffable, which cannot be seized or measured by the intellect, but which are conditioned by sight itself, managing things, as far as possible, to avoid unnecessary fatigue. It seems that the retina can register only four or five images a second. There are those who have imagined that this suggests an inferiority in our sight. But does it not, rather, suggest the contrary? The mobility of the eye triumphs over its state of rest, and four or five periods are enough to trace the underlying course of whatever has happened in the course of a second. The eye does not work by leaps or bounds, but by a sort of inter-weaving of space and time, of extensions and periods, which correspond to the continuity of the eye's circular movement, which is a line and nothing else. Along this invisible line are collections of images that follow, one after the other, images that are accessible to the senses and which therefore correspond to translation, to the eye fixed on a place, at rest, static. The way in which these images succeed each other remains invisible, though we think that we can see it because the passages from one to the other are made with such constant overlapping, the changes modulated so subtly, determined by the eye itself - which is to say, they occur of their own accord, through an adaptation of the eye, they are not imposed on the eye as in the mechanism of the cinema, which is the very reverse of reasonable, where the changes have been cut up arbitrarily into a series of syncopated states that are then obliged to follow one after the other with more or less speed in front of an eye that is stupefied, paralysed, stunned. We have, contrary to what we wanted to do, placed the cart before the horse, agitating what is actually immobile - the sensible impression - and stopping what is actually mobile - the active nature of the eye. The result, apart from the slavery to which our sight is subjected, is the loss of the real intelligence of movement, the loss, in sum, of Man, of the human ... ''Roll it, roll it' [enchainons, enchainons],is an expression that has been used spontaneously by our cinéastes. It could not have been expressed better ... But they do not have any idea what exactly it is that they are rolling [ce qu'ils enchainent]. I wonder if, rather than the source that is usually quoted - certain discoveries in radio-activity (14) - it wasn't the cinema (which was beginning to surprise the world at the end of the nineteenth century) that lies behind the famous principle of discontinuity proposed by Planck: 'Nature proceeds by jumps and by shocks like the needles of a watch'. It is, in any case, the cinematic heresy, which is behind all this, seducing learned heads who are taken in by what they imagine to be highly perfected means of observation. It is this that has completely thrown the real nature of movement out of joint by fixing the attention on what is only an external sign; and, again, by pushing the aberration to the point where that sign is confused with the image as it appears before the senses. Since, as I have already remarked, they do not understand that 'the image as it appears before the senses' becomes 'a period' in movement, and, consequently, that it is no longer the static image, the image which the eye registers when it is at rest ; or which the still or movie camera, based on the model of the stopped eye, can only seize in a snapshot, in a more or less fleeting moment of time. (14) Discoveries in radio-activity! Radio activity is, rather, a consequence of the decomposition of inorganic matter. A body, whether it is organic or not, only begins to disintegrate once active nature [nature naturante] no longer contributes anything to it, once this active nature has left it to its fate: the radio-activity of a corpse. Observation in the laboratory is only made on the basis of the falling apart of the naturalism - the external appearance of nature - of the corpse ... No one has ever discovered a positive radio-activity, one capable of creating living organisms[. Imagine?] naturing nature, a seed growing through a process of jumps, of shocks ...! With regard to naturing nature, all that has been done has been to record in a crude fashion various phases, far separated one from the other, something anyone could do ... And that’s all. And yet it is on that side of things that a true science could be of use. It is only in taking the object apart, in denying it, that subjective naturalism tries to come to know it. It is only some mediaeval alchemists, and Faust, who, with the help of the devil, were able to create a homunculus. Movement, then, can only be expressed by a line; it is an active, ineffable, absolute presence which, at the very limits of our being, can only be symbolised, in a way that is entirely relative, by using a circle, which appears to be closed, without any accident. In other words, it is the circumference which, seeming to us to be perfect, is the line that can best symbolise movement-in-itself, which is transcendent. It is, for us, the very principle of movement, and its origin is the eye in rotation on itself - a course that is irreducible, that escapes analysis or calculation, because it is continuous in reality. It corresponds to the nature of reason in fact and not just in words. If the physicist was, truly, determined to proceed on the basis of experiments, of his own real experience, and if he was willing to exercise more caution than he does with regard to what he calls 'the facts', then he would not be slow to appreciate the value of the eye, starting with his own; and, realising to what an extent the observation of the subject is determined by the eye, he would then be in a position to return to the object. And so he would understand why 'nature is such that it is impossible to determine absolute movement by any conceivable experiment'. That was how Einstein formulated the first principle of what has been called Relativity in June 1905; a brave confession of the inevitable disappointment of a subjective scientist [savant]. It is, in fact, the 'nature' of his eye - not of naturalism - in movement that no experiment can apprehend. The source of what we see, or of the way in which we think about thing, is not difficult to find so long as we do not forget, or so long as we are not ignorant of, the first cause. Our living experience is enough in and of itself to keep us informed as to what is inaccessible to us and as to what we can, nonetheless, do, in practical terms, using it a support. Independently of all accidents, circular movement 'is'. It is easy to be convinced of this in the darkness - easier than it is in the case of translation. Simply because translation is embodied, and movement is not. Movement has no body, and no place, as I have already explained. It is through the circumference that we have the intelligence of it, and the circumference, consequently, is linear. But it must be stressed that this circumference is itself only an approximation. However it might appear, or however well it may serve for our practical needs, a circumference closed on itself, in which the Alpha and the Omega come together, is impossible for us. The coming together of the Alpha and the Omega as we might imagine it in absolute terms never occurs, so that we can only pretend to spirals, to gyres, more or less close to each other, relative in relation to the absolute of movement, which, being an absolute, exists beyond the level at which there is a differentiation between space and time. We can only pretend to spirals! What a stroke of luck for painters! For if we could effectively realise the circumference, we would no longer have any reason to leave the blessedness of its 'Nirvana'. And we advance towards this perfection, towards which every painter deeply committed to his work must tend, by continual and repeated experiments which are only possible through the countless varieties of paths available to the spiral. The circumference and spirals dominated by the rotation of the eye are, thus, the primary lines of this movement. It is up to us to make them 'vibrate' (15) according to our feelings and to our knowledge of the rule which naturally - which is to say, optically - conditions them. 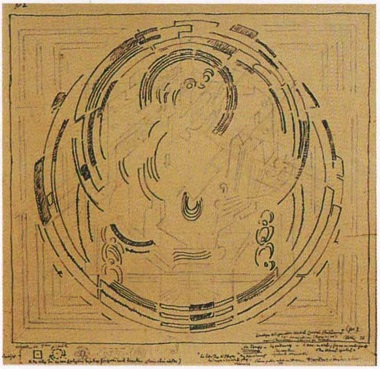 As a direct consequence of the movement that exists as a property of the eye, we have the eye, moving, strolling along the line, where it is bound to follow the course marked out by the periods we have proposed to it, cadences, which enable us to trace the melodies given by the colour, and which weave into counterpoint those points at which the different melodies meet. Arabesque of line and of colour, whose sinuous movements are, of themselves, sufficient to mark the cadences - periods, broken at regular intervals, which leave the cadences open, as in the warp and woof of an invisible chain. The rotation of the eye allows all the combinations that can possibly bring delight to the painter's imagination; it gives free rein to his personal feelings, constantly subject to correction by the rule, which is the constraint that is common to all men, and which permits communication between them. (15) To vibrate. What is “vibration”? It is the way we have of marking different stages in the course followed by a body, a prolonged impulse, a shock which reverberates throughout the world that surrounds it. The periods that mark the course of a runner are vibrations; a ball that has been thrown vibrates; a stone thrown into water puts what surrounds it into a state of agitation so that it reacts with a series of undulations, vibrating. We translate these sequences of events into periods, into discontinuous vibrations, when, by nature, there is only an absolute continuity which we are incapable of grasping. The vibrations have been made by us and not by nature, which knows neither space nor time and whose absolute movement we cannot determine by any sort of calculation. Vibrations belong to naturalism, to an analytical, subjective process of disintegration. They have nothing to do with objective, ontological nature. It is the same for that energy which is based on vibration. Energy too is not to be found in material nature but only in the use we make of certain natural, negative, propensities, tendencies to disintegration, to self-abandonment. We derive energy, we put it to work, by, with a great deal of ingenuity, taking advantage of certain favourable circumstances. To talk about the energy of coal, of waterfalls, of swamps, of petrol, of electricity ... is nonsense. If we were not there, none of that would ever turn into energy. If our will did not stir our own muscles into activity, none of that would ever produce work or energy. We might as well talk about the energy of a pencil, of colour, of a brush, of colours ... without the painter. There is no such thing as a source of material energy other than our own ability to make use of something which, of itself, is coming apart ... To be able to provoke this process of disintegration to serve our own needs - and to make use, through an operation of the will and of the intelligence, of our muscles and of our senses for ends that are objective, on a human scale. That is the real reward for weariness - acts that are of value - and it is followed by a natural process of recovery. Energy is only conserved to the extent that the person who provokes it is conserved. Understood in its real nature, then, rotation can be reduced to line. I know that this term is very relative, but, nonetheless, what is implicit in it is already sufficient to enable us to distinguish a line, lightly applied, from the surface on which it has been traced - from everything that belongs to the plane, to translation. Line implies a direction, and, thus, a movement, fast or slow, according to the way in which it has been stressed, to which the eye, turning on itself, conforms. Direction is opposed to dimension, as time is to space. That is why the classical, Humanist, naturalist mode regarded the line with contempt - because this classical, Humanist, naturalist mode was situated uniquely in the space of appearances. Painting, in the course of once again discovering that it is human, capable of action, natural, has to rediscover the real importance of the line - its ability to draw the spectator along, its melody. This cannot be done in a day because, as I think I demonstrated when I made my own mea culpa, bad habits cannot easily be shaken off. The premonition of rotation, though, in itself, it was perfectly correct, was not sufficient to enable me to express the rotation in the way that was required. That is why it could not be realised, because, in trying to perform the act, we were still thinking of it in a way that was static, and, in the last analysis, we continued to tie the linear and the cursive down, locating them in opposed, balanced planes. However, and I insist on this, the fact that we did not grasp the true meaning of rotation too soon turned out to be an advantage with regard to translation, which thus revealed itself to be more complex than it had appeared to be at the beginning, when it was only produced on the basis of the flat canvas. And, what is more, the inclination of the axis also proved to be the necessary means by which the translation could, in a harmonious manner, affect the passage between itself, nature of space, and the linear rotation, nature of time. So we have nothing to regret. Above all, if we think of those first attempts to discover a painting based on the plane surface, a painting that would be justified uniquely in terms of what we then considered as the 'capacities of the plane' - experiments that finished up in a severe, rigid, intellectual compartmentalisation of the plane surface, whose dimensions were carefully proportioned following precise, inflexible calculations. Worthy as they are of respect, these were efforts without a future, since no intellectual intention can ever put a halt to that which, ultimately, finds its origins in the needs and nature of our physiological life. Between the act of dividing a plane in an abstract manner, and that of realising its worth through the power of the eye, there is nothing in common. In the first case, even painting itself is forgotten, while, in the second, the origin of painting, which is purely optical, is acknowledged. Translation is not a mental operation. It is, quite simply, the eye, living its life, expressing its initial power. Translation on the base-line of the plane, translation on the inclination of the plane - these are possibilities whose successful manifestation in a concrete reality enables us to arrive at other possibilities of the eye, possibilities that are superior because they in turn lead the way to a final resolution, one in which we arrive at unity, in light, in rhythm, in form. Translation, rotation, form-light - these are the hierarchical, ordered stages which every painter who wishes to escape the illusions of naturalism must recognise and know before attempting the realisation of the painting-object. This painting-object we may call traditional painting, so long as we are ready to recognise that tradition is a living principle. It is categorically opposed to all Humanist naturalism, not just to its external shapes but, above all, to its organisational principles. It recognises that this Humanist naturalism is only a subjective subversion that begins with spectacles that are quite dazzling, but ends, inevitably, by showing them in a state of decomposition.